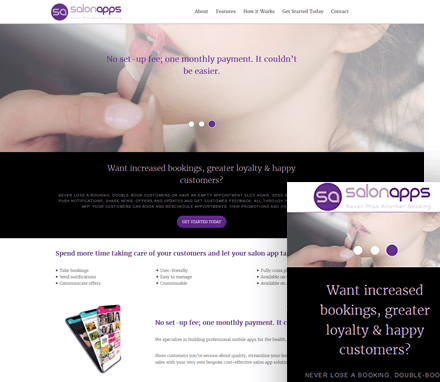 Salon Apps is a new business that creates bespoke booking apps for hair and beauty salons, massage and spa centres, barbers and health clinics. Salon Apps have a dedicated team of in-house designers and app experts that work on creating their salon apps, but they required a new website that would grow their brand. Salon Apps opted for a single page website and went with our Hard Worker Air Design. The website gives lots of information about the features of the app, how it works and explain how salon owners can get started on their own booking systems for their clients. The website features images of the app’s different features and these images open up once clicked so users can see how their app can look. The main call to action on the website is to encourage salon owners to fill in a form that will get them started with a free demo of their bespoke app, so we included lots of buttons or anchor links to encourage click-throughs. We added customisation to the design, adding a blog section to the website so Salon Apps can publish content for their users. Everything from the initial consultation to the end result has been bang on and you have a brilliant, patient and talented team who are very caring and knowledgeable. I am delighted with the end result, so thank you! You would be the first web development agency that I would recommend to anyone looking for a powerful and dynamic web solution.